Übermittelgroß, mittlekräftig, typ- und ausdrucksvoll. Hoher Widerrist, fester Rücken, Kruppe von guter Lage und Länge, sehr harmonische Ober- und Unterlinie, vorne und hinten sehr gut gewinkelt. Geradetretend werden bei gutem Nachschub und freiem Vortritt raumschaffende Gänge gezeigt. TSB ausgeprägt; läßt ab. (V17 BSZS) excelente 17 campeonato alemán 2004. (VA3 USA) excelente seleccionado 3ro campeonato USA 2005 juez Erik Orschler,. (VA2 Costa Rica) excelente seleccionado 2do campeonato costa Rica 2007 juez Hanz Peter K.
Yes, Ernie is in Mexico city since february 2005, he has now meny puppies in México. He is in Kennel VGLAND e-mail jvgh_vging@yahoo.com.mx, the owner is Mr. Vicente Gómez. Ernie is now in Mexico doing pretty well on shows, although in the last All America (continent) contest, he finished 2nd just after Urban Gleissenauer Schloss. He is at Vgland Kennel available as stud. Does anyone know if Erine is located in Germany or is he back in the USA. If he's located in germany does anyone have a contact number for him please. Clearly an alternativ in the breed. Will he stay permanently in the USA or is he / will he be back in Germany? Saw him at Bhzs in 2004, and he was one of those who really left an impression. One interesting thing about him is that he has the same mother as Xork v.d. Leiegegend, a male that is superb in temperament and drives. 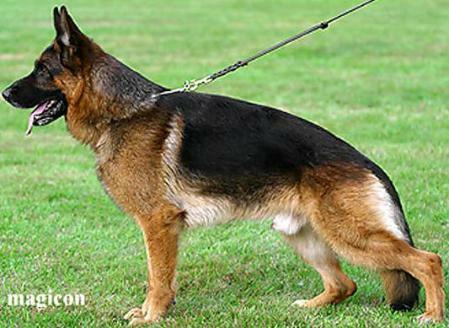 Yes, I have seen this male up close at the USA 2004 Sieger Show, This male is a Nice male with nice drives and very good bite work Nice in the show ring too this male will make his mark in the GSD world in the years to come , He took VA3 in the USA 2004 sieger This male is a nice rich black and Red male. Nice top line and has a very nice gate to him. Had full Bite and does out. I have a DVD of him at the show that I took with are camecorder, If anyone would like to see. I would also like to say NICe head man I could not get over it, This dogs has what it takes and is going to the Top I cant wait to see him at this years sieger shows I send out a thank you to his breeders Nadja Leder of Germany and also to his Owners Sari Nohe, and Karthrin Petzod I thank you for bringing such a nice male to the shows , I am looking forward talking to you all again take care see you soon!!!!!!!!!! Ernie was very impressive going VA at USA and NASS shows. Wonderful pigment and very good looking strong correct male. I have ERNIE puppies arriving in OHIO from Germany this week Please contact me at GSD@VOMBUFLOD.COM if you are interested in a puppy or would like to see pictures of the nice puppies he produces. I've read the Richterbericht HZS V 17 of Ernie and saw his picture. He seems to me very standardtype with lovely pigmentation. Who knows something about his offspring and his qualities for breeding. I have the feeling that he can be of importance. Who can give more information? Is it possible that he can be an alternative? Has anybody seen this dog?? Please let me know if anyone has.